KayKiSpeaks.com: #LOL Did Your Fave Celeb or Social Media Halloween Moment Make Our Top Four?! #LOL Did Your Fave Celeb or Social Media Halloween Moment Make Our Top Four?! This year's halloween costumes were next level, mainly due to the way social media has influenced creatives of all sorts to think outside of the box. People were acting out memorable celeb moments, the Morton Salt container, and classic movies like never before! I had quite a few favorite moments that I think are worth mentioning. First off ( and of course) I have to give it to the Carters. Jay Z, his boo thang Beyonce, and daughter Blue Ivy brought it with the classic film, Coming to America! I can't get over Blue's impression of Vanessa Bell Calloway's epic role as Imani Izzi! So cute!!! Bey and Jay weren't too bad either! The photos below were posted to Bey's instagram. So fun! I also loved Mrs. Marjorie Harvey. If you follow her instagram account you know Mrs. Harvey is just everything anyway, but she also seems to be quite the comedian too. She had heads rolling back and laughs ringing out this weekend as she imitated Love and Hip Hop actress Karlie Redd!! I hollered laughing. It is so hilarious! Honestly. I dieddd. I also REALLY loved what Fab, Emily B, and their kids did this year. 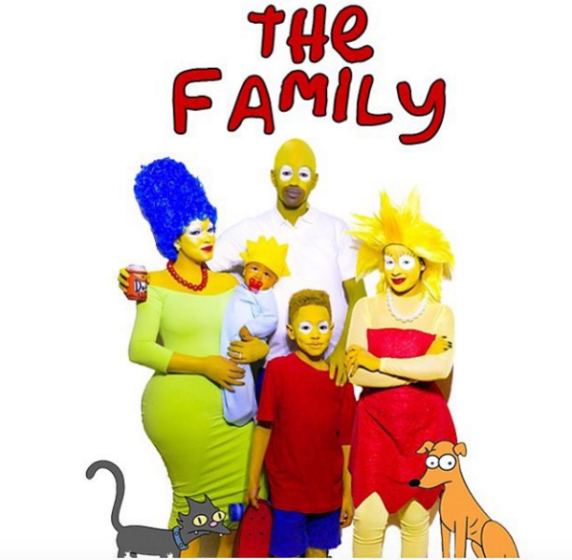 They went as "The Family" bka "The Simpsons" and they really went all out with it. Super cute and fun! Another fave of mine (and honestly, I have no clue who this is) was this mini version of Aladdin, filmed in a hood near you. You guys. I love this so much. Not only did they incorporate one of the latest waves going around for the magic carpet, but they also have a soloist singing A Whole New World, and taking me OUT! SO funny!!! I just loved watching everybody have a good time this weekend! What were some of your favorite moments this weekend?! yo! i am cracking the shits man. the last one im done.